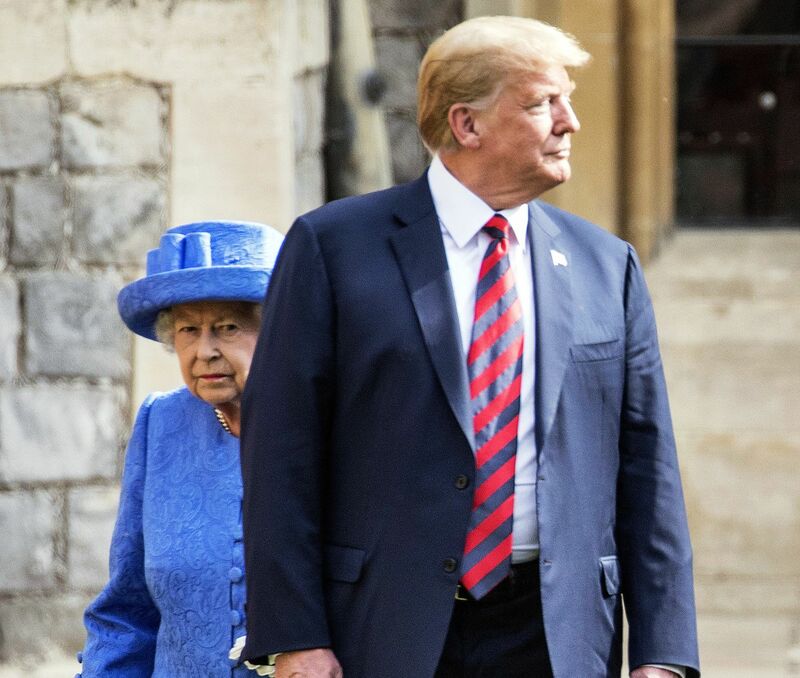 Trumplomacy at its best - The Donald breaks protocol as he walks in front of Queen Elizabeth II during his recent visit to Britain. Editor's note: This piece was submitted last weekend, prior to the Putin-Trump summit. Given yesterday's debacle in Helsinki for America, we cannot help but wonder what Dan's next dream might include! I had the most incredibly bizarre dream the other night. I’m sure it had something to do with the late night news I watched before going to bed. The lead story was about the protests in England against President Trump. According to the news, tens of thousands of Englishmen and Englishwomen took to the streets in opposition to Trump and his visit to their country. Apparently, Trump’s popularity in England is in the loo! I rarely remember my dreams, but this one was different. When I awoke around 5:30 AM, the details of the dream were as vivid and clear to me as the rising sun, and I swear on the Magna Charta, the English Bill of Rights, and the U.S. Constitution that what I lay forth here in this writing is exactly what occurred in my dream. I share my dream only as a plea for help in understanding the hidden meaning of it all. My dream began in the Cabinet Room of the White House. President Trump, just back from his visit to England, had hastily called for a meeting of all Secretaries. That night at a White House dinner consisting of three buckets of Kentucky Fried Chicken, mashed potatoes, and biscuits, the President shared his anger over the English disloyalty with his family and prattled on about making England suffer in some way. Queen Elizabeth agreed and set a date for The Donald’s knighting ceremony six months hence. Every day, President Trump disparaged the English while dining on his daily meal of fish and supersized chips. And, every day, the President grew a bit larger. Finally, the day arrived for President Trump to fly to England and to be admitted into the exclusive “Order of the Knights.” The ceremony was held at Windsor Castle with all the pomp and circumstance duly given to such an occasion, including Squire Trump riding into the castle on a white steed, dismounting in front of the castle chapel, reverently striding to the altar, and getting his dubbing from the Queen. Although the knighting of President Trump had been advertised, according to his demand, across the British Isles for six months, only five people were in attendance at the time of the ceremony: two elderly and somewhat portly white men sporting ‘Make America Great Again’ hats and three beggars. Eating fish and supersized chips every day for six months can only have an adverse effect on the body, and President Trump’s body was no exception. His 239-pounds grew to nearly 300 by the time he mounted the steed with substantial assistance from six pages. The white horse was rather unusual in that it had large orange blotches all throughout its hide, and, when the sun hit rider and horse at just the right angle, the pair could have easily been mistaken for one huge orange statue. Right from the get-go, it was obvious that the horse was no match for its rider. With the Squire on its back, the horse staggered, lurched, and stumbled its way to the chapel entrance and the waiting Queen. Just a few feet from the door, the horse pitched to the left and then keeled over, squashing its rider underneath. The American President was dead! Then, I woke up. Because memory fades quickly, I chose to write down the details of this dream immediately, and the account I have given is what I remember. Dreams are said to have hidden meanings, so I ask you, dear readers, to help me interpret this very unusual dream.